One of my friends who teaches high school in a different district recently messaged me to ask if we are allowed to teach “controversial subjects” in our district. Apparently his district is passing a school board policy to keep teachers from engaging in teaching controversial topics. I do not shy away from teaching controversial topics, and I feel that if approached with intelligent pedagogy, not many topics are off the table. Honestly, if my district were to try passing something like that, I might consider looking for another job. This is a harsh world. One where many of our students, and ourselves, are at ends trying to put together pieces of a puzzle that feels impossible to solve. We need to have difficult conversations. We need to engage in “controversial subjects” in our classrooms. We owe it to our students and our society to engage. 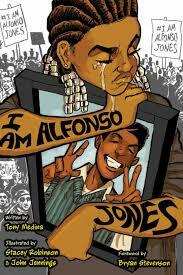 For today, I read I Am Alfonso Jones, a powerful graphic novel about an African American teen, growing up in New York that discovers that his dad is being released from prison after fifteen years for a crime that he did not commit. 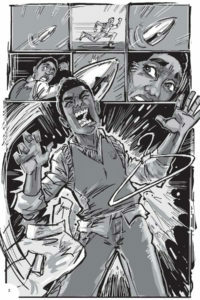 Alfonso never met his dad, other than behind prison glass; he was locked up as Alfonso’s mother was pregnant with him, but super excited for his dad’s release, he is out shopping for his first suit when he is shot dead by a police that mistake a clothing hanger in his hand as a weapon. No real spoilers here. This is the first twenty pages of the book, and I mean, look at the cover above. Most of the book focuses on the after-math of Alfonso’s shooting, and his reporting on it from the spirit world. The book is heavy. And it should be. Over the 150 pages, author Tony Medina gets into race, class, gender, police brutality, protesting, etc. This book is the definition of “controversial subjects,” but while, yes, I guess some people would/will find items in this graphic novel controversial or offensive, at its essence, it’s real and honest. The book puts the majority of the weight on the training of police in this country. And Medina, through the eyes of a dead Alfonso, allows us to stay for a while with the officer that shot and killed Alfonso Jones. As a reader, we get to explore many sides of this issue, and some of them are difficult to navigate. There are no language issues in this book, and the violence is cartoon-y, so if you want to explore this book with a classroom, you can…if you are allowed to teach “controversial subjects.” Will some people respond to this book with “Blue Lives Matter”? Sure. And I think that’s OK. Let’s talk about that. Handle conversations like an adult, and we grow as a society. We need to start having adult conversations about these things. The way things are going, senseless violence will eventually affect too many of us. Why wait to care? Have adult conversations. Care for people. Empathy cannot and will not die with this generation. Read this book. Talk about the issues it raises. Care for people.